This amazingly simple and easy Quinoa Flatbread is healthy and sure to be a new family favorite. 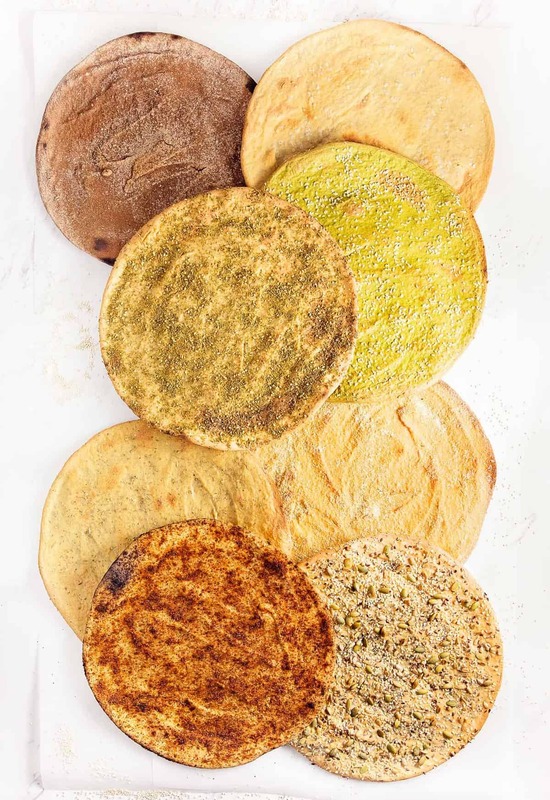 You just may never buy bread again after tasting these delicious flatbreads. 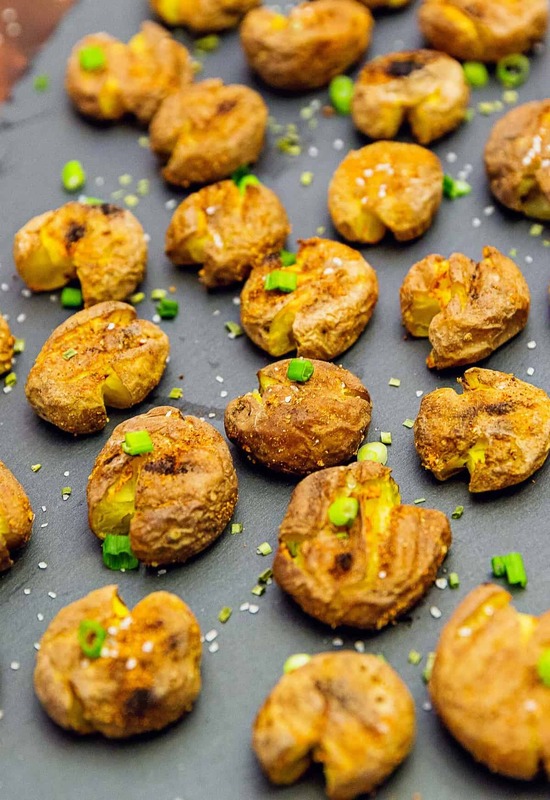 It is versatile and oh so yummy! A fabulous Whole Food Plant Based recipe. Vegan, oil free, sugar free, no processed ingredients. Quinoa flatbread is all the rage. It has been popping up everywhere I look. I told Mom that we really need to check it out especially since we are Whole Food Plant Based and gluten free. Whole Food Plant Based AND gluten free! Every bread we have checked out – if it was oil free and refined sugar free, it had wheat (gluten); if it was gluten free, it had refined sugar or oil. It just doesn’t exist people! If you find this “unicorn bread,” please let us know!!! If you have ever tried to bake something Whole Food Plant Based, not an issue, easy enough, right? Now add the complexity of also making it gluten free; it takes it to a whole “nuther” level. So we have recipe tested a number of WFPB gluten free traditional breads, they are OK, but not amazing – in other words, they don’t rate high enough to make it on our blog. The challenge continues, but then . . . So, when I saw everyone making quinoa flatbread, I was really intrigued. Every social media site I went to, people were mixing 1 cup of quinoa with 1 cup of water, baking it and wahhhla, quinoa flatbread – made it, tried it, while it was good, I knew it could be better! 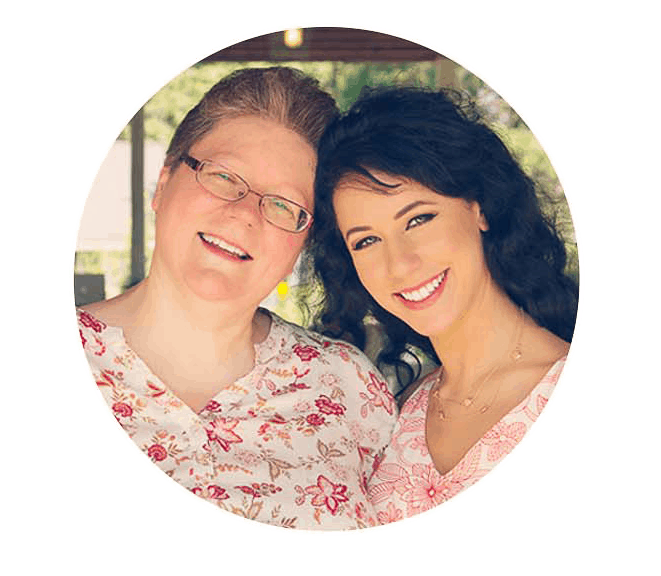 Yes, you read that right, mom and I used 19 pounds of quinoa – testing tons of variations of quinoa flatbread in our quest to create a really great quinoa flatbread recipe. We baked and baked, and baked some more to arrive at quinoa flatbread heaven. Then once we had that down, we started making awesome variations. 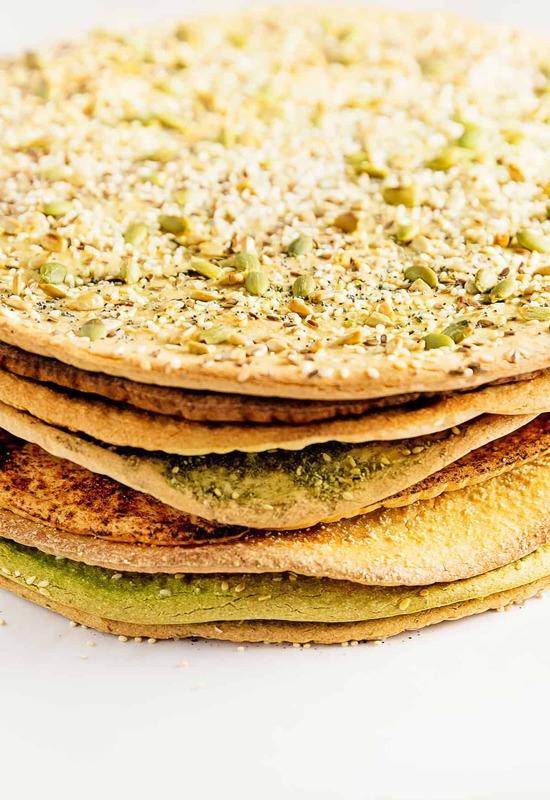 We came up with our Basic Quinoa Flatbread recipe and 7 variations. We actually have about 10 more, but those are a post(s) for another day. Monkey was all over this quinoa bread thing. She was like “Mom, let’s try this thing!” I will be honest, I am not a huge quinoa fan. Never have been, so I had been stalling on testing a quinoa flatbread. But once we made our first successful flatbread, I was hooked. I love the flatbreads super crunchy. Monkey prefers it a little more chewy, but I really love the extra crispy version. The best part is you can make it more chewy or more crunchy depending on your preference, all you do is change the length the flatbread is in the oven on the second (flip-side) baking time. The Red Hot version is my favorite as it reminds me of spicy chips. It is SO crunchy good. The next day, the quinoa bread tends to get chewy (even if it was initially crispy). No problem, just heat up the oven again and crisp that baby right up! It gets extra crispy. 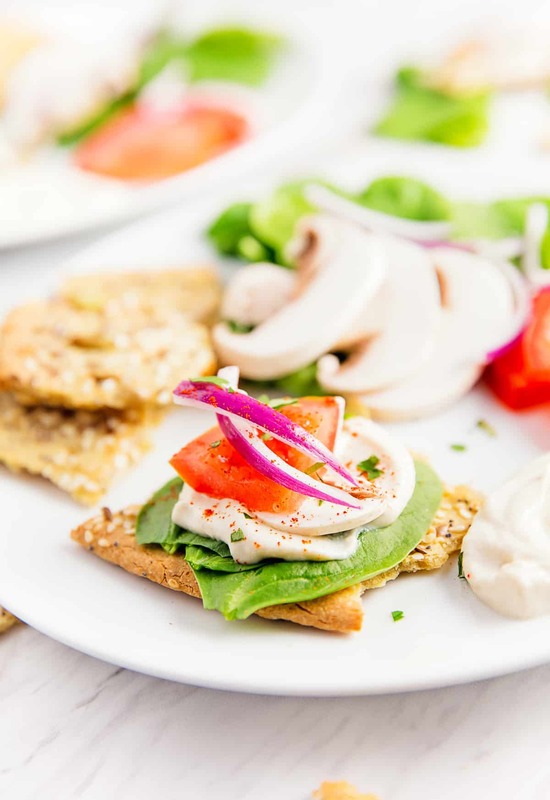 We like to break it up and put it in salads kinda like big flat croutons or fattoush (fattoush = Middle Eastern salad with crispy fried pita bread broken in pieces into the salad). We use a Ninja High Speed Blender with great results. The key is that the quinoa must be broken down into a batter consistency. We used the “Auto IQ Ultra Blend” setting on our Ninja. Our regular food processor was not able to break down the quinoa enough. We honestly believe you need a high-speed blender to make this work. Perhaps a really great food processor might work, but the jury is out. Ameera here! Mom and I did a ton of quinoa flatbread experimentations. We went through 19 pounds of quinoa. Thank goodness, Fresh Thyme had a sale on their bulk quinoa at $4.47 a pound. 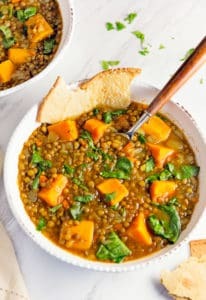 After testing umpteen million quinoa breads, we finally landed on the perfect ingredients and bake times 🙂 We loved using our Basic Quinoa Flatbread with our Moroccan Sweet Potato Lentil Stew! 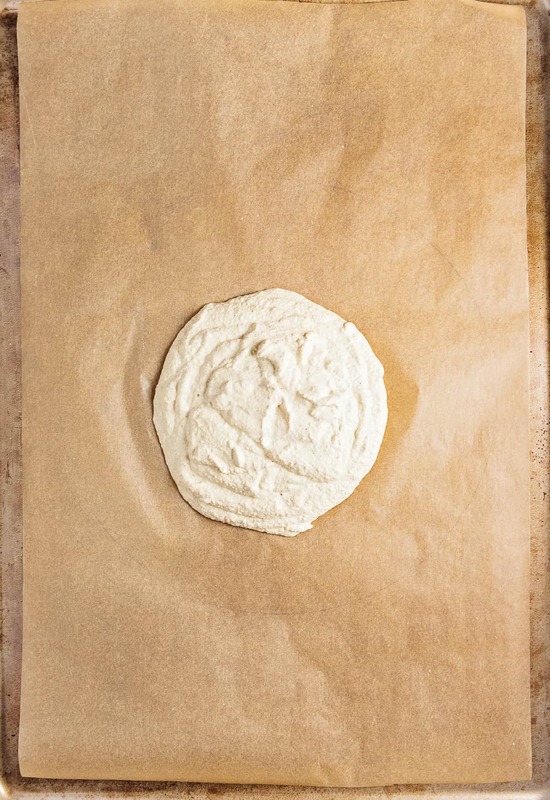 Line a 14 x 20 baking sheet with parchment paper. Invert the parchment paper and trace an 11-inch diameter circle in the center of the parchment paper to use as a pouring guide. 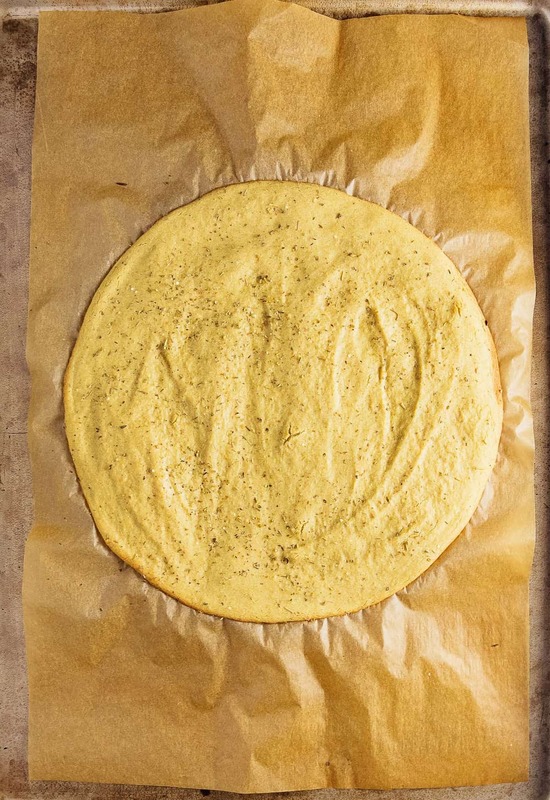 Flip the parchment paper over and place onto the baking sheet. You should be able to see the circle from the other side. Place the dry quinoa in a fine mesh strainer and rinse the quinoa really well with running water for two minutes. This removes the bitterness from the quinoa. Shake to drain excess moisture. Add the rinsed quinoa, plant milk, baking powder, and sea salt into a high speed blender and blend on high for one minute. The batter consistency is key here. Since quinoa has slight variations of “dryness” depending on how old it is, you need to pay attention to the thickness of the batter. The batter should be slightly thicker than a fudgy brownie batter. It will need help with a rubber spatula getting it onto the parchment lined baking sheet. 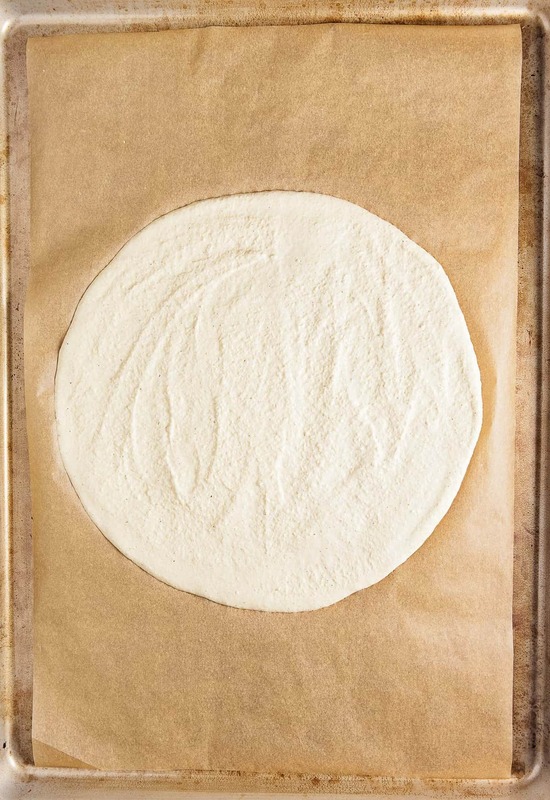 Drop the batter into the center of the circle that you drew on the parchment paper. Once you get ALL the batter out of the high-speed blender, take a rubber spatula and start to spread it out. Working from the center, gently pushing the batter outwards until you reach the outline of the circle. The batter should be spread very thin. Place the quinoa flatbread into the oven and bake for 15 minutes. 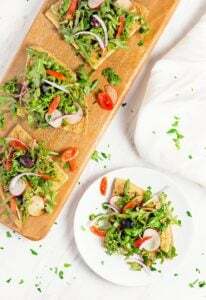 After 15 minutes, remove the quinoa flatbread and using a thin edged spatula, gently loosen the bread from the parchment paper, flip over, and then return to the oven for another 6 to 7 minutes: 6 minutes for crispy, 7 minutes for crispy and crunchy. *Batter: The batter consistency is key. The batter should be thick, but should spread easily with a rubber spatula. It should look like a fudgy brownie batter, but very spreadable. *Batter Thickness or rather thinness: Another key element is to spread the batter very very thin. The batter will not rise much, but since the batter is consisting of crushed quinoa you want the batter thin so it bakes thoroughly. If it is too thick, then your quinoa bread will be gummy. *Baking Time: If you like your quinoa bread super crispy, follow the instructions on baking times. It is very important that you set and USE a timer for both the 1st side and flip side of the baking. Otherwise, you could end up with a gummy flatbread. *Oven Preheat to 425 degrees F: It is very important that your oven is fully preheated before you begin the baking process. *11-inch circle guide: The 11-inch circle guide works really well because it lets you know just how thin the batter should be when spreading it out. *Flip side baking: After the 1st 15 minutes of baking, remove the baking sheet from the oven, use a long thin edged spatula and gently loosen the quinoa flatbread around all the edges. The baked bread will want to stick to the parchment paper, but trust me it comes loose with just a few tugs, then slide your spatula underneath the center of the flatbread, once it is fully loose, very carefully flip it over using tongs (be careful not to tear the flatbread.) It should flip over easily, then return the flatbread to the oven and do the flip-side baking. Be careful, it's HOT! *High Speed Blender: We use a Ninja High Speed Blender with great results. The key is that the quinoa must be broken down into a batter consistency. We used the "Auto IQ Ultra Blend" setting on our Ninja. Our regular food processor did not have the power to break down the quinoa. Ameera here! I love spinach and sesame seeds together. This variation turned out sooo good. We tore pieces of this Spinach and Sesame flatbread and then topped the pieces with sliced avocadoes and tomatoes. Then we sprinkled them with sea salt and hemp seeds. The flavor combination was divine! 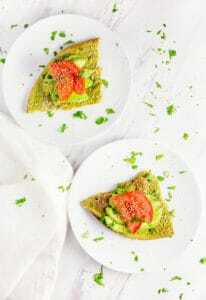 This amazingly simple and easy Quinoa Flatbread is healthy and sure to be a new family favorite. You just may never buy bread again after tasting these delicious flatbreads. It is versatile and oh so yummy! 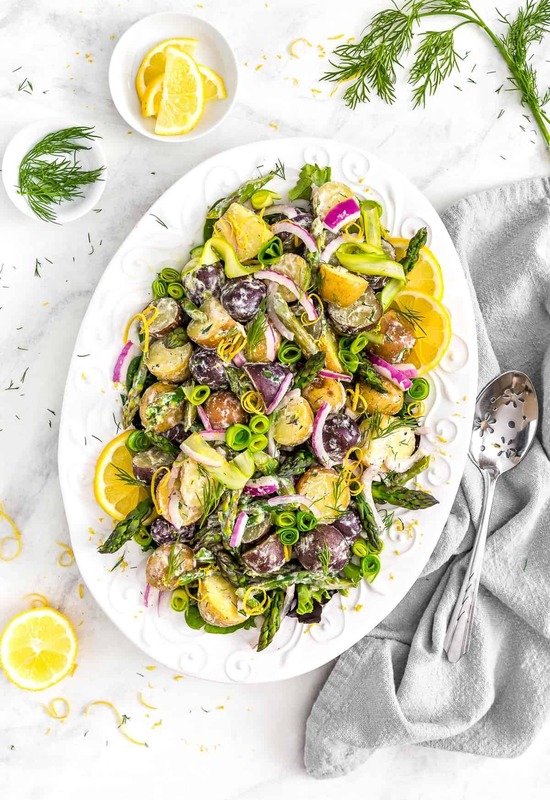 A fabulous Whole Food Plant Based recipe. Oil free, sugar free, no processed ingredients. Add the rinsed quinoa, plant milk, baking powder, sea salt, and fresh spinach into a high speed blender and blend on high for one minute. Ameera here! Of course, I couldn’t let this go by without attempting a chocolate version, right? We absolutely loved this version, but let me tell you a little more. The chocolate and sweetness of this version is very light. It has a hint of chocolate and a hint of sweetness. We tried adding more chocolate and more maple sugar, but it did not improve the flavor. This flavor is like the old-fashioned drum stick chocolate waffle cone. We paired it with our banana nice cream (frozen bananas and unsweetened plain almond milk) and we were loving it. We shaved a little bit of unsweetened dark chocolate on top of the nice cream and we were good to go. Use the chocolate quinoa flatbread like a spoon/scoop. Note: If you are looking at this Chocolate Quinoa Flatbread as a dessert, then this variation is not going to be what you are expecting. It really is beautiful, but very light on flavor. We loved it accompanying our nice cream or a couple pieces for a light snack. Add the rinsed quinoa, plant milk, baking powder, sea salt, unsweetened cocoa powder, and dry maple sugar into a high speed blender and blend on high for one minute. Robin here! I really miss chips. I mean REALLY miss them… *sigh* Every store-bought chip out there has oil, even if it is baked! Crazy huh? So there literally isn’t a chip available for purchasing. 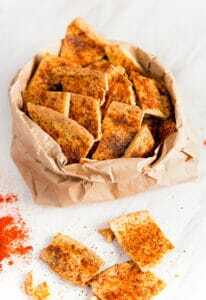 I love spicy chips so when Monkey wanted to make these quinoa flatbreads, I didn’t want to miss an opportunity to make some kind of spicy, crunchy flatbread. 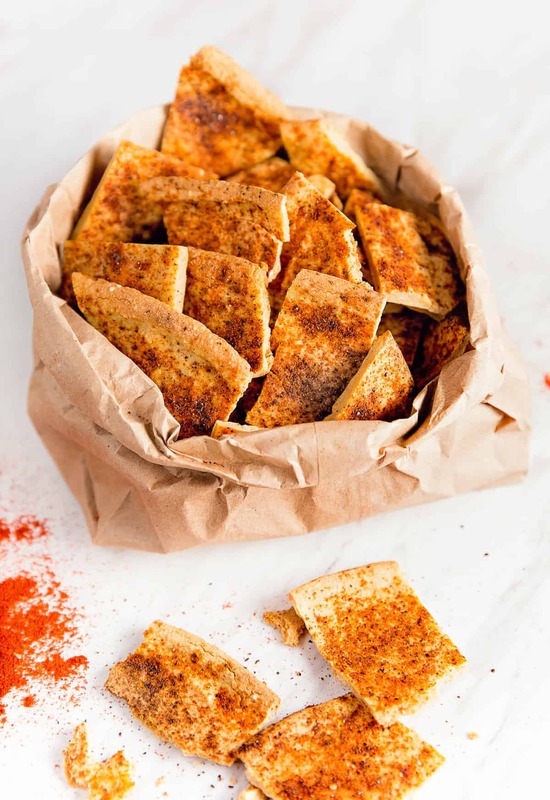 If you bake this flatbread just a tiny bit longer in the oven, you end up with this super crunchy and deliciously spicy flatbread. I was literally devouring it as soon as it came out of the oven. It was so satisfying and good. The only thing I would offer on this one is that in order to get that BIG crunch, you have to bake it a little longer, then you have to expect some extra brown surfaces which was OK by me. The crunchiness was ohhh so worth it. Try this, you will love it! Add the rinsed quinoa, plant milk, baking powder, sea salt, and cayenne pepper into a high speed blender and blend on high for one minute. Robin here! I love cornbread. I grew up eating tons of cornbread! This flatbread has a wonderful light corn flavor with just a hint of sweetness. I especially love to couple it with Cajun red beans and tomatoes, sautéed spinach, and rice. I like to use it to soak up the Cajun red beans and seasoning juice, so gosh darn good! Add the rinsed quinoa, plant milk, baking powder, sea salt, cornmeal, and dry maple sugar into a high speed blender and blend on high for one minute. Ameera here! Zaatar bread (zaatar manoushi) is a traditional Middle Eastern flatbread made with wheat flour. The zaatar seasoning is traditionally mixed with lemon juice and olive oil creating a paste, then spread onto a flatbread. I knew it might be slightly challenging since we left out the lemon juice and olive oil, but it turned out super tasty. I had Michael test drive it and he enjoyed it. WIN-WIN! Robin here! This one is super delicious. 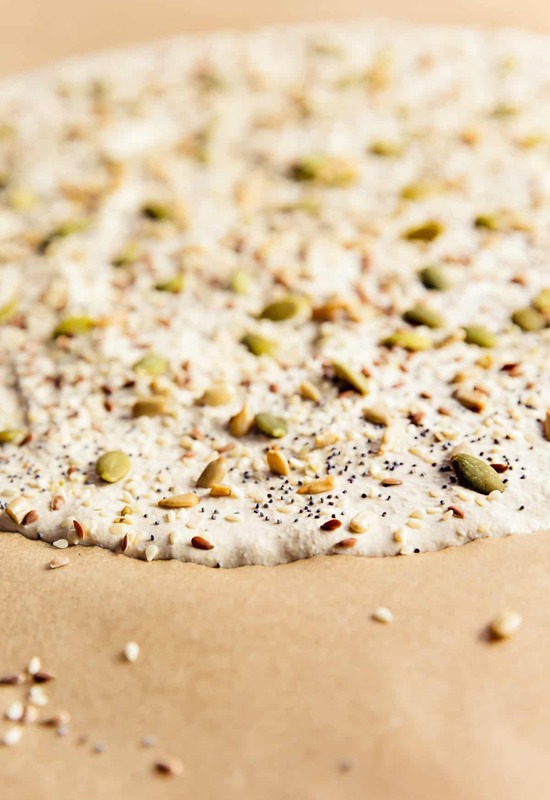 The seeds add wonderful flavor to this flatbread. We made a WFPB compliant cream cheese and spread it onto torn pieces of the Six Super Seeds Quinoa Flatbread, then added a spinach leaf, thinly sliced tomato, button mushroom slice, and a sliver or two of red onion, and a sprinkle of sweet paprika and flat leaf parsley – ohhhhh my gosh, soooo gosh darned good! 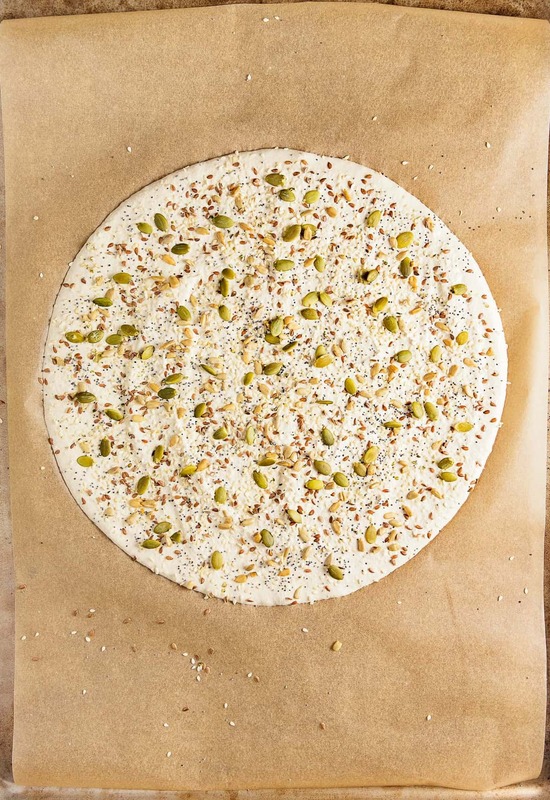 Sprinkle the top with sesame seeds, poppy seeds, hemp seeds, pepitas (pumpkin seeds), golden flax seeds, and sunflower seeds. Robin here! We love arugula salads, and we make them all the time. 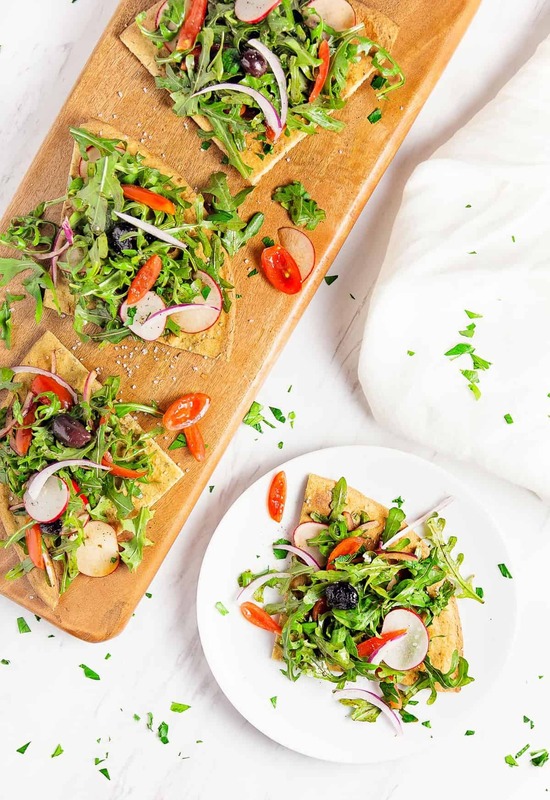 For this flatbread, we topped it with a simple arugula salad consisting of arugula greens, tomatoes, red onions, slivered radishes, olives, and a splash of balsamic vinegar. Delish! Add the rinsed quinoa, plant milk, baking powder, sea salt, Italian seasoning,andnutritional yeastinto a high speed blender and blend on high for one minute. Storage: Place in a storage bag or container and use within 3 days. Freezes well. I’m impressed with all the varieties you came up with. I can’t wait to try them!! I’m curious of the yield. 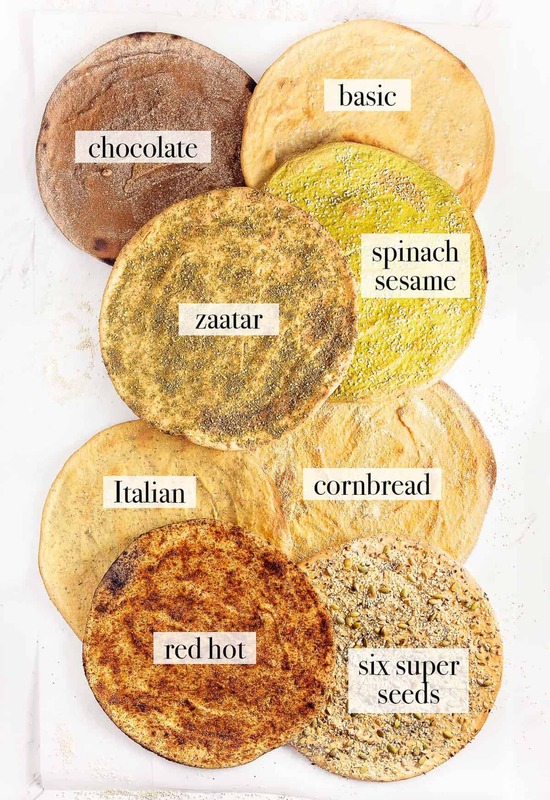 Each recipe makes only 1 flatbread. Am I ready this correctly? Hi Cheryl! Thank you so much for your lovely comment and your question! Yes, each recipe yields one 11inch Quinoa Flatbread. We hope you love it as much as we do! So ….haven’t tried this yet but I bought 5lbs of quinoa so I will….. Just thought cinnamon bun flavouring would be awesome!! This recipe is amazing! It is everything I have been looking for – gluten free, vegan, easy, tastes like bread, can be used as pizza base, or a wrap…my dreams have come true!! Thank you! 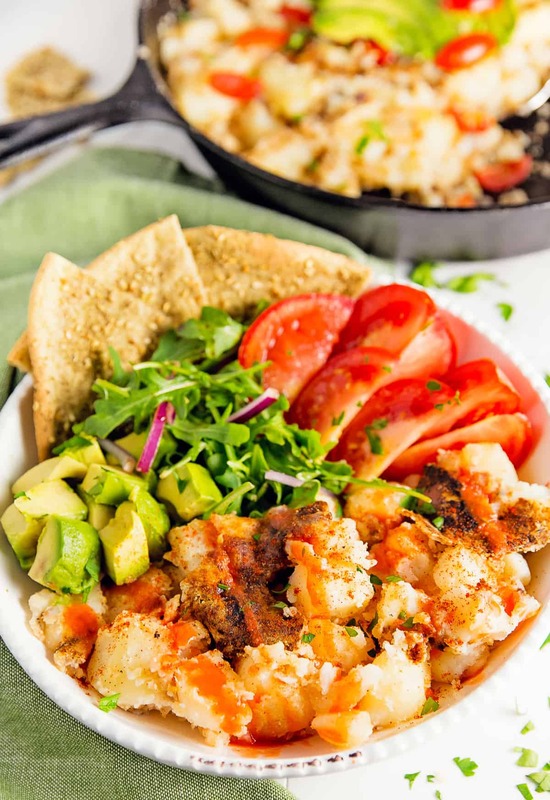 Can you use quinoa flour for this recipe and not whole quinoa ? We’ve never tried it with quinoa flour before. Not sure how it would turn out, but you could totally experiment. You won’t need to the blender, just stir in the baking powder and sea salt, and slowly add in the plant milk until you reach a brownie batter (thick paste) consistency. If you try it, let us know how it went. Could you use it as a pizza base? So excited to try this recipe-I am making my first rejuvelac using quinoa instead of wheat berries, because I already had it in my pantry! I have two questions for you 1) did you try sprouting the quinoa before making your recipe and if not do you think it would work? And make the quinoa easier to break down in the blender 2) does quinoa actually age making it unusable for this recipe? Or does it just require more water? Seems everything has an expiration date these days! 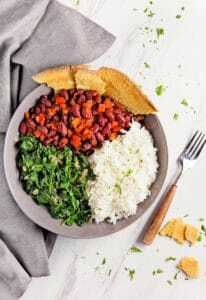 have you ever tried this with brown rice? No, we have not tried brown rice for this recipe. hi! this question may sound silly haha but I didnt understand if you cook the quinoa or not? should I just rinse it and then blend it? Not a silly question at all. It is uncooked quinoa that is rinsed and then blended with the other ingredients. 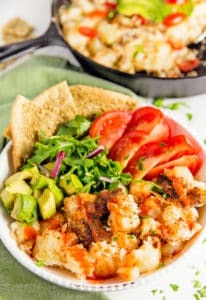 Will this work with store-bought quinoa flour instead of ground quinoa and would you have to adjust any measurements? Also what difference does it make between a plant based milk, dairy milk, and water? 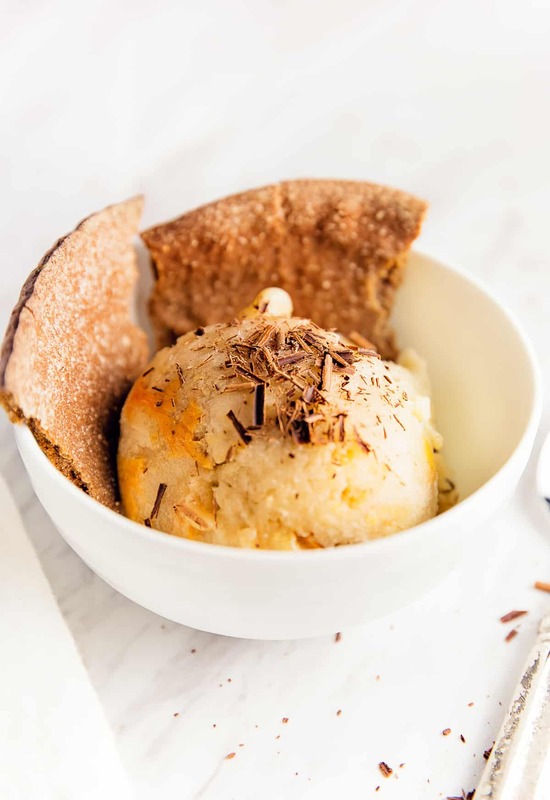 Unfortunately, we don’t think that the quinoa flour will work for this particular recipe as the quinoa creates a brownie batter type consistency with a little texture from the blended whole dry uncooked quinoa. Additionally, we are whole food plant based so that is why we use the plant milk. We have received feedback from readers that water works equally as well; however we have not tried it. Hope you enjoy this recipe as much as we do! Could you make them smaller than 11’? I make red lentil tortillas and get a dozen out of the recipe. This recipe makes one large 11inch diameter flatbread. You can definitely make smaller flatbreads. The amount you can make is determined by the diameter. The smaller the flatbreads the more you can make. Too much of a pain in the neck going up and down the page to see the recipe. I left before using it. These look interesting but i’m wondering why you didn’t just get quinoa flour or quinoa flakes to work with instead of grinding whole quinoa? Is there some reason not to use these that makes it different? We use the whole quinoa because when it is blended it gives the flatbread batter texture. Quinoa flour or flakes would make the batter too thick and would create a more pancake like bread instead of a chewy/crunchy flatbread. Hope this helps! Thank you! That helps to know it is more Naan-like, makes sense now. I was thinking it was supposed to be crispy like crackers/chips! So I’ll try again, and definitely won’t need to bake as long!! I can do Naan!!! That’s basically what it was like at the end of the cooking time in recipe, I just thought it was supposed to be different! So this is OK, no problems! And it did taste good!! Thanks for sharing a fun recipe – my learning curve finally caught up! Hi there. Great recipe. I was having trouble getting it off my parchment paper so tried it on my silicon baking sheet. Came off easily. Now to get better at spreading it evenly. Glad you are enjoying our Quinoa Flatbread recipe. We make this recipe a couple times a week, and we haven’t had it stick before. Perhaps the batter isn’t spread thin enough, and when you are ready to flip it sticks. We are glad that the silicon baking sheet worked for you. Just made this and excited to try it. If it goes well maybe my gluten free daughter will enjoy it to! She loves to cook and bake! Is there a way to print these recipes in a suitable format other than just hitting Ctrl P? I don’t see a print button option. I would love to print a copy of some of these. 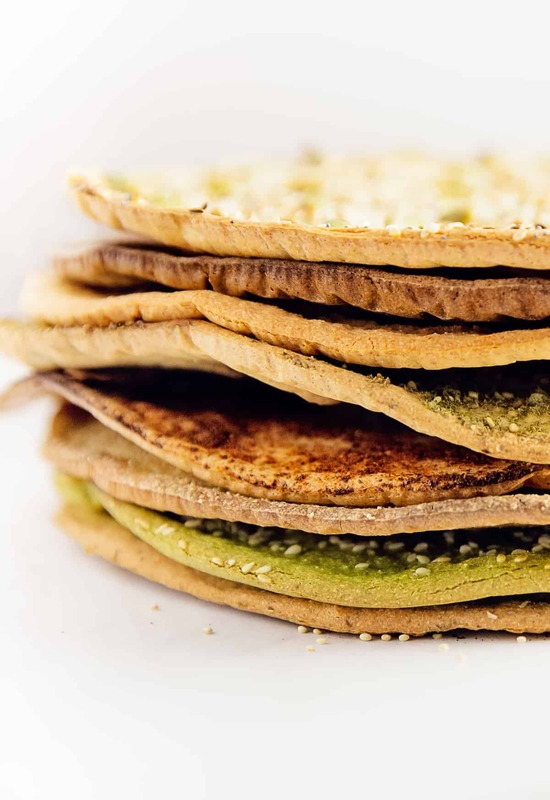 There are 8 Quinoa Flatbread variations, and each one has its own recipe card. Scroll to the variation you would like to print and in the recipe card right underneath the picture is a “print” button. It will print the corresponding recipe. Hope this helps. Please let us know if you have any other questions. Yaaayy! So thrilled you tried our Italian Quinoa Flatbread and enjoyed it! Adding avocado is definitely a delicious topper! We make this recipe regularly throughout the week. Perfect for snacks, pizza crust, soup dippers, the possibilities are endless. We truly appreciate you taking the time to write and thank you for your wonderful feedback! looking forward to trying this, i was wondering what made you choose to do it with dry quinoa? it seams like a lot just asking completely out of curiosity. Thank you for thinking about giving this recipe a try. As mentioned in the post, we talk about how WFPBers in the facebook groups we belong to were talking about making flatbreads from dried quinoa, and we decided to create our own variation. 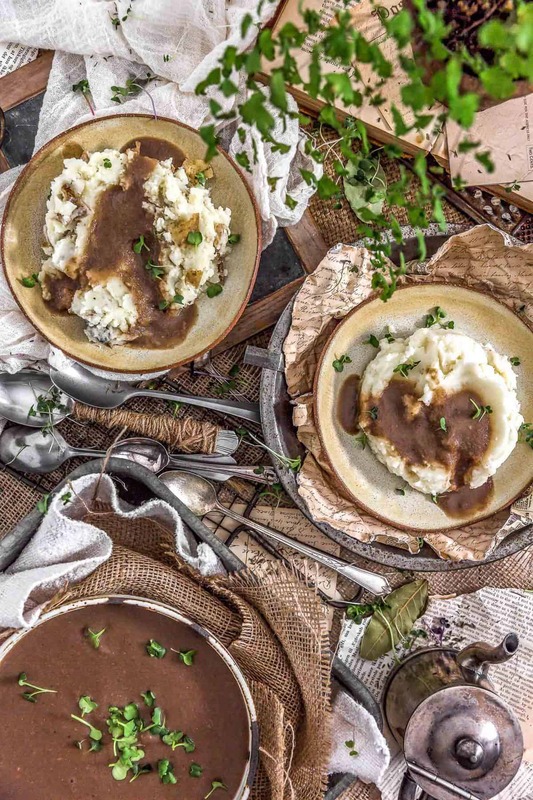 We hope you enjoy this recipe as much as we do! Where have you two been all my life? These look fabulous, thank you! Awe, you are too sweet. Thank you so much for your kind words! We truly appreciate your support. Hope you enjoy these flatbreads as much as we do.